Osram is showing its first LED spotlight for event and studio lighting at Prolight + Sound taking place from 10 to 13 April in Frankfurt. In addition, a new LED component with adjustable colour temperature as well as new variants of the lamps for moving-head spotlights will be on display. The Kreios SL, the first LED spotlight from Osram, is celebrating its debut in Frankfurt. With luminous flux exceeding 3000 lumens, it is currently the strongest LED spotlight available on the market. The luminaire is ideal for effect light with exhibitions, fairs and shows or as background lighting for studio recordings. Kreios SL replaces standard 100 W to 250 W halogen spotlight solutions and is an especially economic alternative for event and studio experts; the spotlight has a service life of up to 30,000 hours, and relamping is not required. 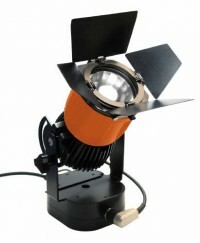 With comparable halogen spotlights on the other hand, relamping has to be carried out after around 800 hours. The light of the LED spotlight can be flexibly adapted to specific applications, and the width of the light cone can be scaled in size according to requirements from 40 to 120°. With a spot reflector a narrow angle of 24° is also possible, and the light of the Kreios SL can also be continuously dimmed from 5 to 100%. Integrated cooling runs very quietly to ensure low-noise operation. Osram Opto Semiconductors is presenting the new Osram Ostar Stage LED in the "tunable white" version for use in cardanic spotlights that can be pivoted through all axes, so-called moving heads. The LEDs enable differing white tones to be created ranging from 2,700 Kelvin (warm white) to 10,000 Kelvin (cold white), made possible by two warm-white and two cold-white chips arranged diagonally in the package. Thanks to their glass cover the Osram Ostar Stage LED has a much lower profile than previous standard components, meaning that spotlights can be designed with very compact dimensions. The new "tunable white" LED now supplements the Osram Ostar Stage LED coloured and pure white variants. New variants of the Sirius family will also be on display: Sirius HRI 132 W and the 330 W XL and 330 W X8 versions now supplement the portfolio. The 132 watt version has currently the lowest power consumption in the Sirius family and is used to create even more compact moving heads because less cooling is necessary. The XL version features an extended arc distance with gas discharge and ensures optimised luminous efficacy and distribution. The X8 version currently has the highest colour temperature of 8000 K within the Sirius lamp range and emits conspicuous effect light onto the stage. Due to their high level of luminous efficacy, discharge lamps for moving heads are still the first choice. The Sirius reflector lamps from Osram are comparatively small in terms of construction size and thus enable compact and lightweight, highly movable spotlights. This means that more of these luminaires can be configured next to each other within a space to enable even more spectacular lighting effects. The Lok-it! lamp range has also gained a new wattage: Lok-it! HTI 1,500 W features an extended arc distance to enable larger light cones with more homogeneous illumination, and the new lamp can be seen in the Mac AirFX moving head on the stand of Martin Professional. As with all products from the lamp/base system, stage technicians can also easily and quickly replace the 1,500 W version: simply insert the lamp and rotate it, and it's then clicked in and precisely adjusted. Lok-it! not only ensures problem-free relamping but is also extremely restrained during operation: so-called eXtreme Seal Technology (XS technology) reduces temperature sensitivity with discharge lamps so that cooling can also be reduced, and this means that luminaires operate with less noise. At Prolight + Sound, Osram's fair booth can be found in Hall 9.0, Stand D10.